Husband Kanchha, wife Lhemi wife, together with sons, Sumba 20, Pasang 16 live together in a two story house that needs to come down and be replaced. Sons Furi 24, Chhiri 22, and Mingmar 18 live elsewhere. 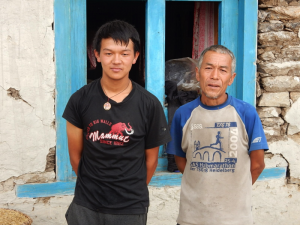 Kanchha was outside working in his fields when each of the quakes hit. When the first one came he saw cattle down below in the valley run away. That first one caused minor damage, but the last quake caused most of the damage to his house. Then the aftershocks made things worse with the widening of the cracks in the walls. It was only after the third quake that the family moved into the temporary shelter where they continue to live. Now they only go into the house to store things or when they need things inside.